Last modified on March 21st, 2018. 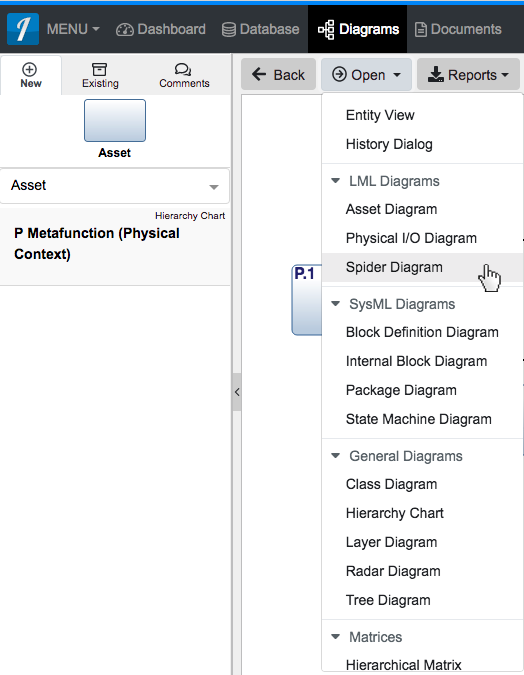 In Innoslate, you can view a 'Spider Diagram' from wherever the 'Open' drop-down menu is available on the toolbar (Entity View, Database View, within a Document, within a Diagram, within a Test Suite). This will navigate you to view a 'Spider Diagram,' where you can begin adding and removing entities. Click the 'Save' button located on the toolbar to persist your changes to your project’s database. In Innoslate, you can view a ‘Spider Diagram’ from wherever the ‘Open’ drop-down menu is available on the toolbar (Entity View, Database View, within a Document, within a Diagram, within a Test Suite). This will navigate you to view a ‘Spider Diagram,’ where you can begin adding and removing entities. Click the ‘Save’ button located on the toolbar to persist your changes to your project’s database.